Poseetion o humerus (shawn in reid). Anterior view. 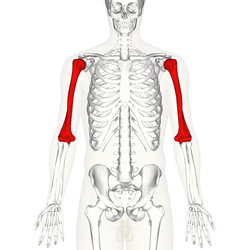 The humerus (/ˈhjuːmərəs/; ME frae Laitin humerus, umerus upper airm, shaulder; cf. Gothic ams shoulder, Greek ōmos. 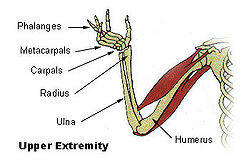 Plural: humeri) is a lang bane in the airm or forelimb that runs frae the shouder tae the elbow. This page wis last eeditit on 22 August 2014, at 00:50.